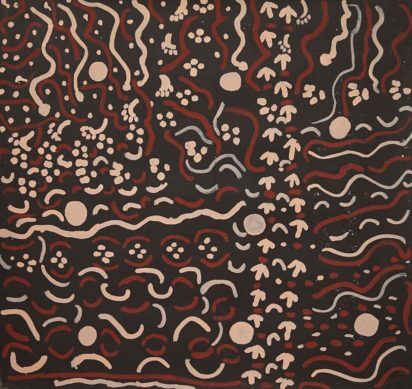 Emu paintings in Aboriginal art show many aspects of the life cycle of this animal. As one of the largest animals on the Australian continent, the emu represents an important food source for traditional Aboriginal groups. The large eggs of the emu are also highly prized as a bush food. Aboriginal people are skilled trackers and hunters and rely on their knowledge of nature and the environment to assist them. By knowing what sorts of bush foods attract the emu, the hunter knows where the birds will be during certain times of year. Emu tucker is the grass seeds that attract the birds so knowledge of these locations helps the hunter. The Emu is an integral part of the Dreaming stories of inland Australia. One story tells how the flightless bird lost his ability to fly. In the Creation story the emu was burned by a bush fire that damaged his wings and so he could no longer fly. The nesting habits of the emu also feature in Dreamtime stories. The male emu takes on responsibility for the eggs in the nest and hatches them and raises the chicks. Emu Dreaming sites in Central Australia are associated with male initiation rituals and the ceremonies are held in important locations on the Emu Dreaming tracks. The emu is represented in Aboriginal art in many forms including the tracks, nesting sites, food locations, Creation Ancestor images and the form of the bird from rock art sites and from contemporary paintings.